The first of four new short stories told from the perspective of everyone's favorite Divergent love interest! More Four! 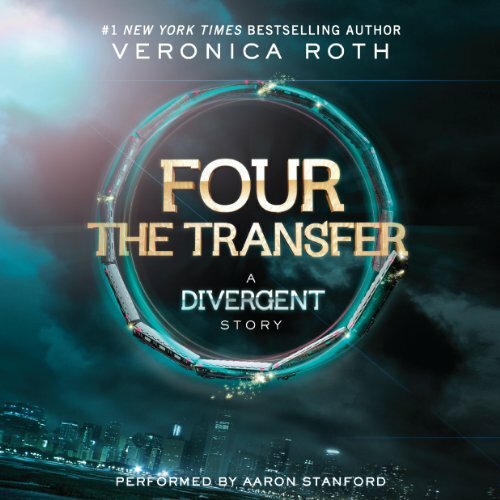 Fans of the Divergent series by #1 New York Times bestselling author Veronica Roth will be thrilled by "The Transfer," the first of four new short stories told from Four's perspective. Each brief story explores the world of the Divergent series through the eyes of the mysterious but charismatic Tobias Eaton, revealing previously unknown facets of his personality, backstory, and relationships. PLEASE! DO NOT WASTE YOUR MONEY! There is absolutely no reason to purchase this book, especially for $7.93 and 1 hour and sixteen minutes, all which were taken from the other two books. Not one thing is new, this short story is just pieced together with Tobias' memories and his fear landscape he took with Beatrice, everything we already knew. The story would have been fine if it were released right after the first book, except it still would have been way over priced. I feel like I was deceived and taken advantage of, if a new book is released, it should contain at least "something" new. I will say Aaron did a good job with narration and I am looking forward to listening to Allegiant tomorrow but I must admit being ripped off right before punched my attitude a little. 62 sur 65 personne(s) ont trouvé cet avis utile. I guess I wasn't paying attention when I ordered this. This book is basically the first couple chapters from the Divergent book, albeit from Four's perspective. Expensive mistake as it was short and nothing new. VERY disappointing! I just didn't love this as much as the rest of the series. It really was a disappointment. What would have made FOUR The Transfer: A Divergent Story better? We pretty much already know all that is in this book. I think the upcoming books will be good/better and it would be fun to get Four's perspective when he meets Tris, but this book is so short it shouldn't be worth a credit from Audible. The author should have combined all the Four books into one. It feels a little like she is just trying to make money off the release of these books one a at a time. The story is great I loved it. I am happy to have background. What aspect of Aaron Stanford’s performance would you have changed? If you could play editor, what scene or scenes would you have cut from FOUR The Transfer: A Divergent Story? Four's initiation experience is so similar to the one Tris has in the beginning with the train etc, I would have liked to have had something different. I felt like I knew what to expect too much with this short story. Combine them all in a set and sell them as a set. Then it would feel worth using one of my whole credits. People who are interested in how four got his name. What was most disappointing about Veronica Roth’s story? It wasn't the complete story for the price. It provided a small but of background to a main character in the Divergent series. Overall, the book was disappointing for the price and what you get. It covers what feels like a small chapter of Fours story. Would you listen to The Transfer: A Divergent Story again? Why? Yes because they story was interesting and it was cool seeing how Tobias thinks and why he chose dauntless. Tobias, he's basically the only character..
Who would you have cast as narrator instead of Aaron Stanford? Yes, it's short enough to do so. Great story but not worth the money. Too short to be worth $8 or a $15 credit. I was waiting for this short story for over a month cuz i am a HUGE fan of the Divergent series, and finally its here. I ADORED this short story by Veronica Roth it was fantastic hearing it as Four's perspective. The beginning of Divergent we hear of Tris's POV, but now its Four's and we get to see how his life was and his struggles with his father. I don't want to spoil it to u just trust me if u loved the book Divergent, you will DEFINITELY love The Transfer as well. Please buy it now and listen to it its just an hour long. I can't wait till the other three short stories comes out !!! I want to hear more from Four! What did you love best about The Transfer: A Divergent Story? I like that it is from Fours point of view. What other book might you compare The Transfer: A Divergent Story to and why? I would compare it to Dream Dark: a Beautiful Creatures story, told from Link's point of view. I love to get another's point of view. Everything he did a great job. Its's a great story. The background on Four is perfect. It just leaves you wanting more info, more story line. I believe Veronica Roth could write an entire book on Four and Divergent fans would eat it up! If you liked Divergent and Four's character you'll enjoy this lil reading about him. Its not expencive and worth the money. Nice little treat while we wait! Well if they are strong divergent fans then of course this is a fun little short story. There are no real surprises, if I was asked to write Four's story this is probably what I would of thought to write. From reading the books this is what I gathered had happend but it was still fun to listen to.